Before approaching a dog that is fearful and possibly growling, assess the situation to determine what your plan of action should be. If it is a strange dog that appears injured or is acting aggressive (i.e. barking and snapping in addition to the growling), call the number for your local animal control. 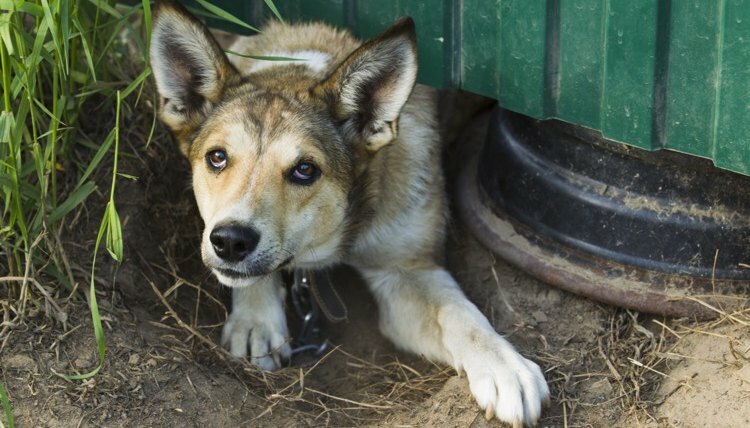 It's also important to use caution even if you're familiar with the dog -- whether it's a foster dog, your own pet, or your friend's -- as dogs that are frightened behave in unpredictable ways. One wrong move (usually caused by impatience) can easily make the situation worse. Note that these instructions are just for approaching and stroking a dog in an attempt to build trust, and does not include steps on how to capture and/or bring the fearful dog elsewhere. Step 1 - Squat down, facing sideways, so you are not facing the dog directly. Position yourself far enough away from the dog so he doesn't retreat or attack. As soon as you see him make a move or escalate his fear behavior, stop and squat down. You don't want him to feel like you are cornering or chasing him. Step 2 - Extend one hand, low to the ground and with your palm up. Step 3 - Call the dog gently to you. Don't raise your voice in either a commanding or excited way. Step 4 - This step is important! Wait for the dog to come toward you. This requires patience, but is more effective and much safer than trying to move forward and capture the dog. Step 5 - Gently stroke the dog under the chin or on the upper chest. Do not pet the top of his head or grab for his collar or neck as soon as he is within reach. What Are Triggers for Aggressive Dogs?